Even though it hasn’t exactly worked out the first few times companies have attempted it, there’s another movement underway to create a social browser. Currently, RockMelt, Mozilla, and Flock are all trying to fuse social elements into the way we all surf the web. And two of those are doing it on top of Chrome (or Chromium), RockMelt and Flock. But each of those may simply be too much. Why not just go to the source and add a thin layer? 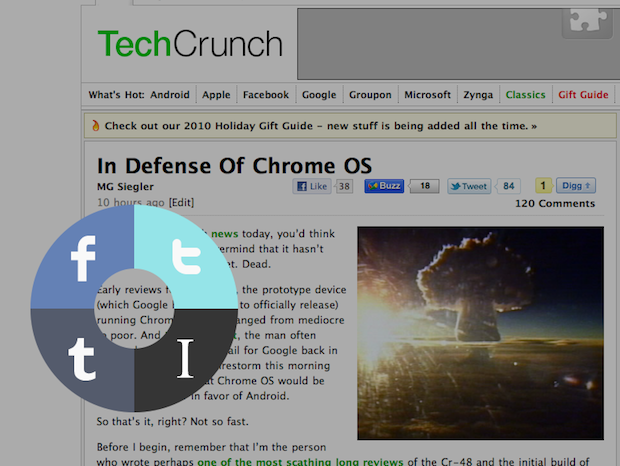 That’s exactly what Cortex, a social extension for Chrome, allows you to do. Instead of trying to rework some of the UI elements of the Chrome browser to make room for sharing and/or social elements, Cortex simply adds a sharing overlay to any site you’re on when you click and hold down your mouse button. Using this mechanism, you can share to Facebook, Twitter, Tumblr, or Instapaper (assuming you set up each of those). It’s simple and brilliant. All you do is click and hold, the Cortex sharing wheel appears. Then you select which service you want to share an article (or image) with. And if you hover over one of those areas for a second, you’ll see an option appear for you to leave a message alongside the share. This will show up as your tweet, Facebook Wall posting, etc. If you set it up, you can also use this wheel to share directly with certain Facebook friends. Cortex is the work of two developers, Eric Wolf and Joey Primiani, who have managed to get their extension over 10,000 active users in just a few weeks. Primiani was previously an intern at Google where he helped design the touch interfaces for search on mobile and tablet devices. That work is clearly paying off here, and Cortex brings a touch-like approach to Chrome on the desktop. And it’s easy to imagine a sharing mechanism like this eventually being implemented on touch devices as well. The key to Cortex is simplicity and speed. You just hold down the mouse button and you can share. The extension picks the best title and image for you automatically. And based on my tests, it’s really good at that. There’s no need to click multiple times to share something, it’s click once, drag, and go. You can share something in 2 or 3 seconds. I’ve written previously about the speed of sharing, and how important it is. Cortex takes it to the next level. Find the extension here, and learn more in the video below.